On January 1, 1968, newly minted U.S.N. Ensign Tom Sparkman stepped aboard the USS Benewah (APB-35), for the first time. A 260 ft, olive drab, floating barracks, docked near Dong Tam, in the Mekong River Delta of south Vietnam—The Benewah was an unusual vessel. A retro-fitted WWII Landing Ship Tank (LST), it housed 300 Navy crew members along with the crews of 20 U.S. Army gunboats—an additional 600 troops, plus their boats, which used the Benewah's two 90-foot pontoons as docks, while she anchored in the muddy water. To these men—both Army and Navy—Tom Sparkman would soon become one of the most beloved junior officers in the Southeast Asia. You see Ensign Sparkman, primarily assigned as the Benewah's Electronics Material Officer, also had a very special key. That key, assigned to him as part of his secondary duty as the ship's Welfare and Recreation Officer, was the key to the cooler that held Benewah's allotment of beer. The assignment earned him the nickname "Beer King"*. As the W&R officer, one of Sparkmans' jobs was to make sure that the Benewah's 240 cases of beer, a months supply, arrived safely off the supply ships and remained in cold storage, under lock and key. Sparkman also found out, as the W&R officer, recreation in a war zone, was pretty rare—he notes, "The only Recreation we had, with rare exceptions, was to drink beer." Because the Benewah housed so many men, and because she also spent most of her time anchored near the fortified Army base of the 2nd Brigade, 9th Infantry Division, in Dong Tam, she became, in what military parlance, is know as a "High Value Target" to the Viet Cong. At night, the area in and around the Benewah, took rocket and mortar fire two of three times a week, throughout all of 1968. During the day the gunboats would patrol the mosquito infested shores of the Mekong—battling opressive heat, humidity and small arms fire. These soldiers and sailors endured almost 24 hour combat conditions. 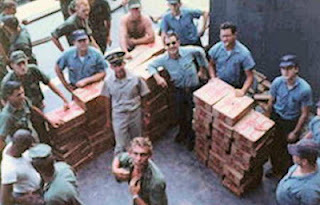 If anybody needed a cold beer, it was the men living aboard the USS Benewah—and Ensign Sparkman made sure they got it. Tom Sparkman gives a fantastic account—far better than I could do—of his time as a junior officer and "Beer King" of the USS Benewah, on his personal website—it's worth the read. Tom was lucky enough to come back from Vietnam. But please, on this Memorial Day, please raise a pint to all the men and women who fought and served in our armed services—be it those slogging through rice patties, running across the grasses of prop blown LZs, or the ones like Tom Sparkman who helped give those men a little piece of home—especially for those who never came back. *Modern ships—USN or otherwise—have engineering crew members who are know as Oil King/Water King. Those crew members are responsible for all the fuel and water on-board. "Beer King" is a tongue-in-cheek nod to that title.